'Why Are They Shooting?' E. Pittsburgh Enraged Over Police Killing Of Black Teen Antwon Rose Jr., 17, was riding in a car suspected of having been used in an earlier shooting. He ran after police stopped the vehicle and was shot three times by an East Pittsburgh police officer. People rallied in front of the Allegheny County Courthouse in Pittsburgh on Thursday, protesting the death of 17-year-old Antwon Rose Jr. 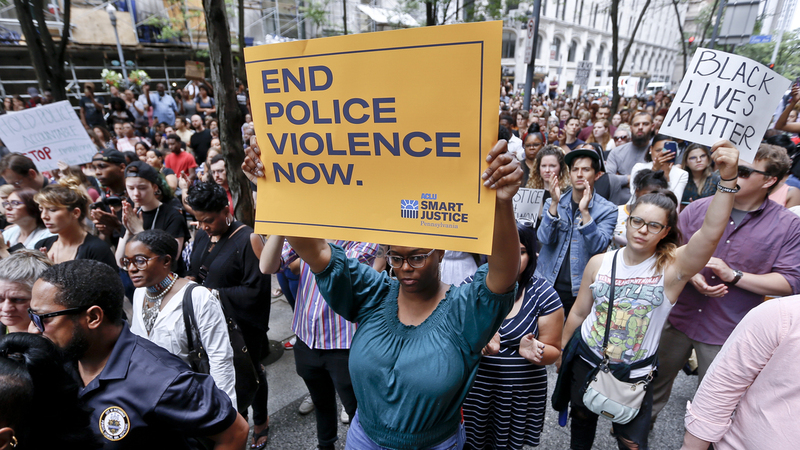 The shooting death of a black teenager by police in the Pittsburgh area on Tuesday night has sparked protests from angry residents demanding to know why Antwon Rose Jr. was killed. Rose, 17, was riding in a vehicle that had been pulled over because officers suspected it had been used in a shooting that happened minutes earlier Tuesday. Video taken by a nearby witness shows two people running from the car; the sounds of three shots ring out right as another police car arrives. Rose was unarmed when he was shot by an East Pittsburgh police officer, Allegheny County Police Superintendent Coleman McDonough said at a news conference Wednesday. Two weapons were later recovered from the vehicle. Police also described why the car was stopped in connection with the earlier shooting. "At approximately 8:20 PM, County 9-1-1 received multiple calls reporting that shots were fired and that a male had been shot in the 800 block of Kirkpatrick Avenue in North Braddock," the Allegheny County Police Department said on Facebook. "Callers reported that a vehicle was seen fleeing the scene, and were able to provide a description of that vehicle. North Braddock Police and paramedics responded and found a 22-year-old male who had been shot." About 13 minutes later in East Pittsburgh, police spotted a vehicle that matching the description: a silver Chevy Cruze with a window shot out. McDonough said police pulled over the vehicle and ordered the 20-year-old driver to the ground. That's when Rose and another unidentified passenger fled and the officer opened fire. A second officer also was present. "Why are they shooting?" an unidentified female voice asks in the video posted on social media that shows two people running as three shots ring out. "All they did was run, and they're shooting at them." Rose was hit by all three bullets, McDonough said, and brought to McKeesport Hospital. He was pronounced dead at 9:19 p.m. The officer has been placed on administrative leave and Allegheny County police are investigating. The Allegheny County District Attorney's Office will determine whether to file charges, according to the police statement. The officer who shot and killed Rose has not been identified. "City officials say the officer was sworn in just hours earlier but had been with the department for two weeks and had eight years of law enforcement experience," The Associated Press reports. "Any loss of life is tragic, and especially the loss of life of a child," Pittsburgh Mayor William Peduto said in a statement. "This is a devastating situation, and I am saddened for Antwon Rose and his family." Rose was a senior at Pittsburgh's Woodland Hills High School, reports The New York Times. "He was an excellent student," who took Advanced Placement classes, Superintendent Al Johnson told the newspaper. Over the past school year, he added, "we've lost four students to gun violence." As the video of Tuesday's shooting racked up views and anger spread through the community, hundreds of protesters took to the streets. Some gathered outside the East Pittsburgh Police Department on Wednesday, holding up signs reading, "Justice4Antwon" and "End Police Violence Now," reports the Pittsburgh Post-Gazette. "I was born and raised in this city, and I shouldn't be afraid to walk out the door," 27-year-old Maya Randolph told the newspaper. High-profile police shootings involving unarmed black men — in Ferguson, Mo., in Sacramento, Calif., and in Baton Rouge, La. — and sometimes caught on video have sparked outrage across the country in recent years. When asked whether the officer who shot Rose was white, McDonough responded, "I don't understand what that has to do with the situation." "I understand in today's atmosphere any time a young man is killed, there's cause for outrage in some areas," he said. "However, I would urge people to give us time to conduct an objective investigation." Police are asking witnesses to step forward. The driver of the vehicle Rose was in has been released, and the second passenger remains at large, McDonough said. Police were not wearing body cameras or using dashboard cameras at the time of the shooting, according to McDonough. But he cautioned against relying solely on the witness video, which begins after the vehicle was pulled over. "It has to be taken into context of the entire investigation," McDonough said. "It's a snapshot in time." Hundreds of protesters gathered Thursday at the Allegheny County Courthouse in Pittsburgh, decrying police use of force and gun violence, reports the AP.